PLANS to build a six-storey block of flats on the old ice rink site in Queen Square have been thrown out by a government planning inspector. Developers Stonehurst Estates wanted to build a block of 31 flats on the site with offices and other commercial uses on the ground floor. The council’s planning committee narrowly rejected this proposal in October last year, but the developers appealed.. 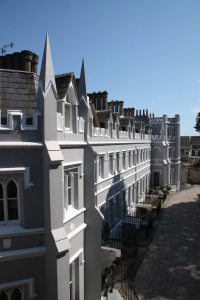 The MCHA has consistently objected to a six-storey building on this because of the damaging impact it would have on both the conservation area and the listed buildings Wykeham Terrace, the churchyard of St Nicholas and the church itself.